I was having a conversation with a friend recently about whether it’s possible to change behaviors, specifically negative behaviors, or are you stuck with them? I was of the opinion that you can’t change behaviors, or at least it’s exceptionally difficult, and the best you could would be to blunt the impact of negative behaviors. 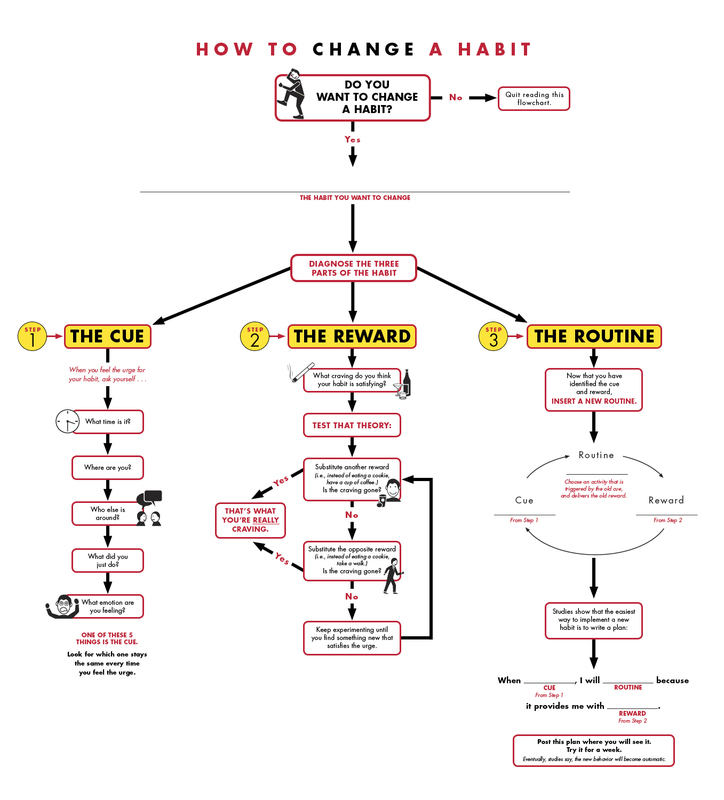 If you watched the video above you’ll have seen that Charles Duhigg believes that it is possible to change habits using a simple three step process described in the flow chart below. I’ve just finished reading Duhigg’s book ‘The Power of Habit‘ in which he describes in detail how individuals, organizations and societies all seem to exhibit this same pattern of a cue triggering a specific behavior, presumably for a specific reward. For individuals habits are an automatic behavior that involve little conscious thought. You are unthinkingly going through the motions. This of course explains why it’s so hard to change engrained habits but this book provides a practical way of identifying your triggers, testing what they are, understanding what the reward is that you’re seeking and then packaging all this together to make the cue trigger a different, more productive behavior. I don’t know about you but I feel as though I’ve just been shown an important key to universal behavior and I’m looking forward to working out ways to cut out the Boston Cream donuts!